Black and white portrait of roan stallion, Mr. 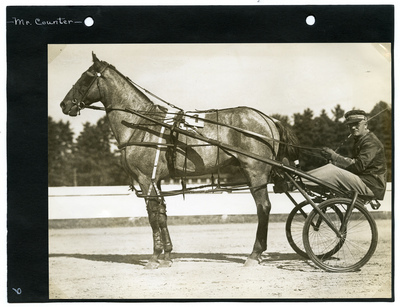 Counter wearing saddle number four, Pierce Chappelle up at the Rochester Rair races, Cold Spring Park, Rochester, N.H. on Thursday, September 30, 1937. The pair placed second in all three heats of the 2.20 Class Pace.